One of my jobs today was pricking out some Digitalis 'Candy Mountain'. First I wetted a compost mix of no. 1 to the right moisture until it held some form in my hand. 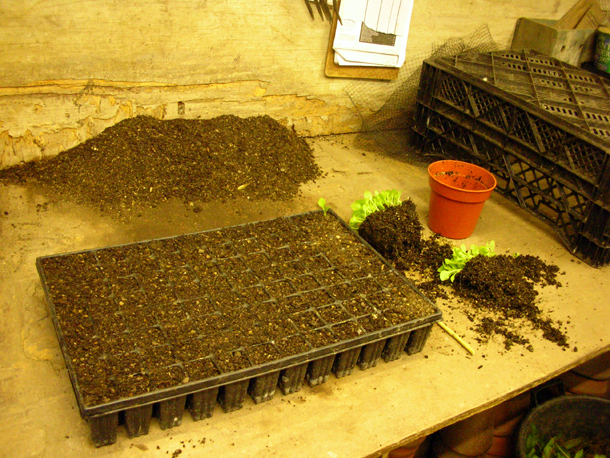 Then I filled up a plug tray with this soil, lifted it slightly and dropped the tray down on the floor, dibbed my fingers in each plug very lightly so that I could see the soil had gone down into the plugs properly, and filled any gaps if necessary. As they were trays of 96 it was best to carry them by holding the middle rather than the sides because of the weight of the soil. Then we took the seedlings out of its pot, eased sections of them apart gently. With a dibber I poked a hole into a plug, carefully lifted out a seedling by its leaves lowered the roots gently into the hole and using the dibber covered soil around it. Being lefthanded I worked from right to left so as not minimise crushing any by accident and put larger ones in the middle and smaller ones on the outside. Then I put them in a cold frame watered them in and put a dutch light over it as well as some shade.